That archive document from my collection details the concert played by the Berlin Philharmonic conducted by Wilhelm Furtwängler on January 22 and 23 1945. It was held in the Admiralspalast theatre in Berlin which the orchestra had moved to after the Philharmonie Hall was destroyed by bombs in November 1943. 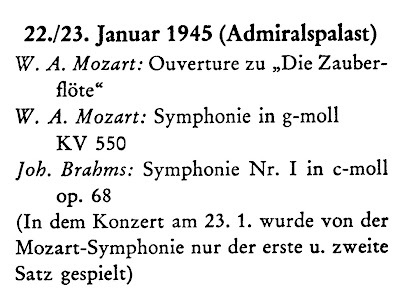 The footnote explains that on January 23 only the first two movements of the Mozart symphony were played. This was presumably due to interruption by an air raid as Berlin was under heavy attack at the time. In an age when a mobile phone ringing in a Mahler symphony causes a Twitter firestorm it is impossible to imagine what concert going was like for the audience and musicians at the time. 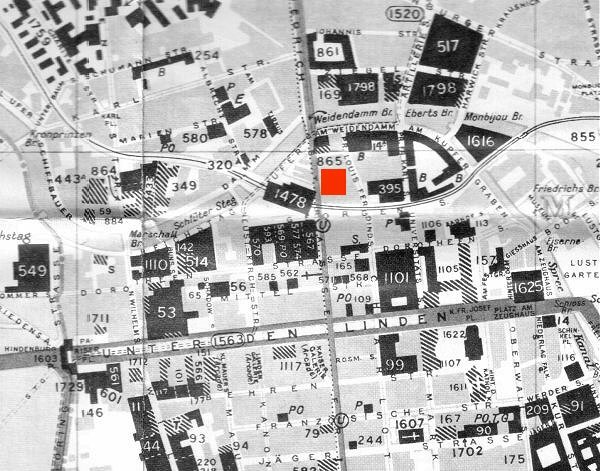 Below is a 1944 British intelligence map from my library used by Allied bomber aimers for their night raids - the strategically important buildings are marked in black. I have added the Admiralspalast as a red square to show its vulnerable position: directly across Friedrichstraße is a major railway terminus, to the east the complex marked 14B is the Berlin military garrison's headquarters, while 53 to the west on Unter den Linden is the Reich Ministry of the Interior. 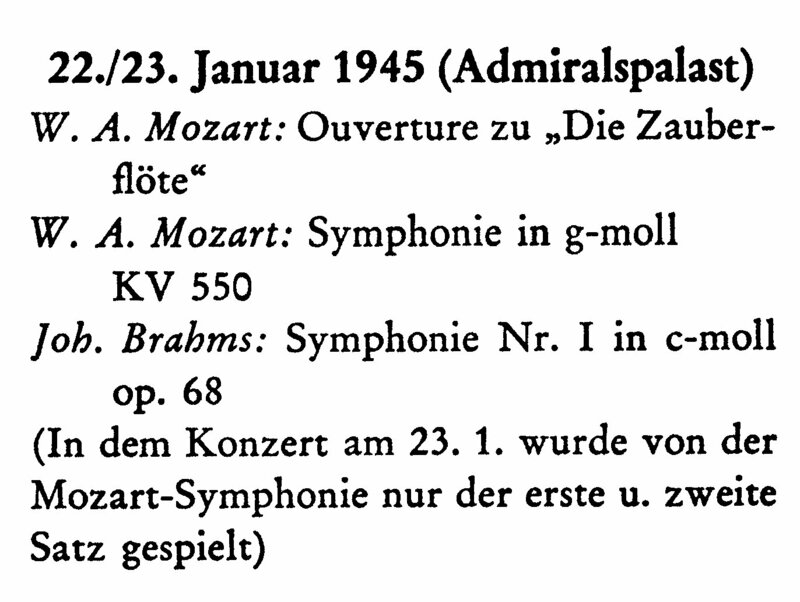 It appears that the near miss in the Mozart was the final straw for Furtwängler, because the concert on January 23 was the last that he conducted in wartime Berlin before fleeing to Switzerland via Vienna - his next appearance with the Berlin Philharmonic was in May 1947 when he gave an all Beethoven programme. But those two concerts were not the last played by the orchestra under the Third Reich. On March 28 - just six weeks before Germany surrendered - Robert Heger conducted their last wartime concert in a programme that included, appropriately, the closing scene from Götterdämmerung. The story of that final concert is in The Berlin Philharmonic's darkest hour and there is more on music in wartime Berlin in Furtwängler and the forgotten new music. Naxos have archive recordings of Robert Heger conducting Der Rosenkavalier and excerpts from Siegfried. 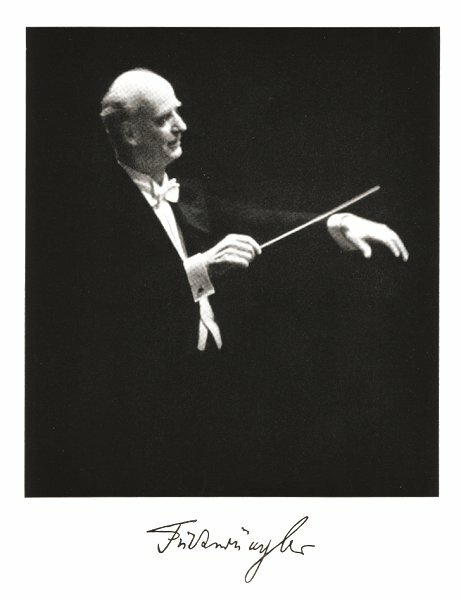 There is a CD (Tahra FURT 1006) that has some WW2 Furtwangler performances, including the 4th movement of the Brahms piece in the Jan. 23, 1945 concert. The performance is amazing! It has a drive and electricity that is stunning. It sounds like they are playing for their lives. Once you hear this, all other Brahms 1st Symphony performances sound like sleepwalking.